Space stations have a long history in science fiction television and movies. Gene Roddenberry's scenario of enormous starships unable to land on planets assumes a system of space stations and space dry-docks where construction and repairs takes place. Until Star Trek: The Motion Picture, our view of this system was limited to Deep Space Station K-7 from "The Trouble With Tribbles." K-7 is in many ways a primitive prototype for Deep Space Nine (DS9); it has a Federation administrator, recreation facilities (including a bar), and a variety of alien guests engaged in a variety of semi-legal activities. There's even a slight structural resemblance, with a central core surrounded by three extending arms. This station has turned up in model form several times over the years; surprising, considering the brevity of its appearance on screen. Star Trek: The Motion Picture opened the floodgates on space stations. 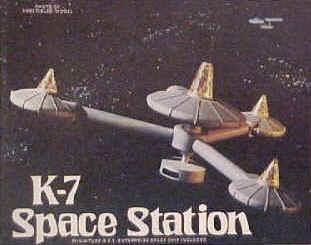 The movie's expansive budget allowed for several spectacular station models, including the drydock, earth-orbit station, and Epsilon 9. Subsequent films reused these models, occasionally with new detailing and a name change. The most impressive of the film Treks space stations was the miniature built for Star Trek III by Industrial Light and magic. This miles-long, earth-orbiting spacedock, reused in every succeeding Trek film and several Next Generation episodes, features the same sort of complex internal neon and fiber-optic lighting system used on the DS9 model. Designer Herman Zimmerman's DS9 is a throwback to the wheel-shaped stations common in 1950s B-movies and 2001: A Space Odyssey. This shape generally was used so that such a station, when rotating, creates the effect of gravity in the outer ring. Star Trek's technology assumes artificially generated gravity, making the ring design something of an anachronism. Of course, DS9 was originally a Cardassian structure; their architecture is evident in the patterns of threes and the many triangular details. Apparently the Cardassians have the same fondness for the number three exhibited by the Martians in Paramount's classic War of the Worlds (1953). Typical of the fabulous world of Star Trek cross-references, is the beautiful title montage of station shots that opens each episode of Star Trek: Deep Space Nine. This opening sequence is homage to the beautiful Enterprise drydock montage in Star Trek: The Motion Picture.